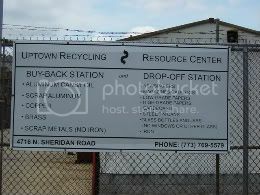 Uptown recycling center is a branch of the resource center, which is a non-profit organization that has demonstrated innovative techniques for recycling and reusing material. This recycling center is for everyone in and out of the uptown community to bring their recycleble items that are either used up or taking space in their homes. The center accepts aluminum and steel cans; brown, clear, and green glass bottles and jars; newspaper; and cardboard.They employ people living near the recycling facility and turn more than 99% of what they pick up into new products.